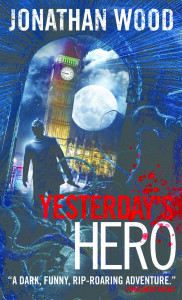 I’m excited to share a fresh guest post from Jonathan Wood, author of No Hero and the brand-new Yesterday’s Hero, which is being released in only a few short days! Jonathan is a great writer, both funny and fun, and his first book read like a Weird Kurt Russell movie. Luckily for us, he’s got some pointers here that will give your next writing project some Kurtly verve. From the beginning, the basic concept behind my Hero series has been to graft an urban fantasy story onto an action thriller backbone. Basically I want to have magic and aliens, and zombie T-Rexes, and I also want things to blow up in the most impressive way possible. It’s a standard having a cake and subsequently eating it scenario. Obviously, I am not alone in this desire. A few people have been kind enough to say nice things about my action scenes, so I thought I’d share a few pointers that I’ve learned along the way. For better or worse, these days people see most of their action scenes at the movies. Your audience’s understanding of the language and grammar of violence will be strongly shaped by this influence. Therefore, you should be familiar with it too. So go on Netflix, get out your ladle, and start scraping the bottom of the barrel. Watch martial arts films, watch B movies, watch Hollywood blockbusters. Hell, Michael Bay may direct a shoddy movie, but the word “Bayhem” has entered the English language for a reason. That said, there are some action movies that may be more worth your time than others. For my money, both The Raid and The Raid 2 are master classes in cinematic violence, and well worth your time. You’re writing, not directing a movie, so it’s also good to see how others have translated the cinematic language into the literary form. Well… with the books I’m talking about, literary might be stretching it. But there are a couple of authors who have already taken this model and run with it. Clive Cussler often gets top billing in this department, but personally I have found the top-line action thriller writers to be James Rollins, Andy McDermott, and Matt Reilley. Adrenaline junky pulp-tastic reads each and every one of them. Possibly the single most important thing to remember about action scenes: they mean nothing to us if we don’t care about the people involved. This is why so many action movies fail. Because they don’t make us give a damn before the fuse ignites. An action scene is a character struggling violently to get something they want. For us to care about the struggle we have to be invested in the character getting what they want. OK, once you’re ready to put pen to paper for your action scene, probably the most fundamental thing to know is where your characters are and when. Action scenes are frequently chaotic, and having a good basic sense for where everyone and everything is at any point in time can help you keep track of things. For example, Jack can’t get flipped over the leaping great white shark into the car’s windshield until Sally has detonated the oil barrels behind the car sending it flying into the air. Obviously. One word of warning, blocking is an area where I think it’s easy to get lost in the details. I’ve personally never needed to draw out a map (though I know that works for some people). I usually just like to have a rough sense for where and when as I go into the scene. But I also like to give myself some room to play as the scene develops. Speaking of details… Action scenes often involve a lot of description. This is going on over here, therefore this goes on over here, but then this happens, which, etc, etc. Just as with any descriptive passage, less is more. Describe the general action and then throw in the detail that makes it real. “The car detonated with a massive whoomph,” gives you one impression. “The car detonated with a massive whoomph, catapulting Mrs Hodgkin’s flaming tabby cat through the windshield,” gives you quite another. Not sure which detail to include? Again, stick with the basics – what matters to your POV character? It’s impossible for a character to pay attention to everything going on in an action scene. Rather, they are going to pay attention to what matters to them and their immediate survival. The fate of Mrs Hodgkin’s cat may be critical to them, or it may be an incidental bloody smear if what really matters is retrieving the original text of the Necronomicon from the back seat of the car. Your POV character’s experience is your route map through the chaos of your blocking, and they’ll point out the interesting stuff along the way. As a side note, by focusing on POV and telling details, you should find that a lot of the pacing of the action scene will take care of itself. Less important moments will speed by, while those that make a difference will get highlighted and take more time. OK, this one’s a little dangerous, but if ever there was a time to throw stuff in because it’s cool, the action scene is it. These are your big show-stopper moments. So, indulge. Have the backflipping great white shark. Have the fire create a flaming arch that your protagonist has to drive her motorcycle through. Have some fun. Drop a few jaws. This is a basic macro-plot rule. Escalate the scale of the problem the characters face over the course of time. But it also works on a micro level for action scenes. And it’s a good guideline for throwing in “because it’s cool” elements. These frequently belong later in the scene once the scale of the conflict has escalated. A fight can start as two guys slugging it out in a bar. But then a guy with a gun shows up. And then a supporting column gives way. And then the fire starts. Which means the police are on their way. Which is how the running gun battle through the street starts. Which is sort of how they end having a massive hand-to-hand battle up on top of the racing L-train. Really where you stop is up to you. And those are pretty much the basics. As with every part of the writing toolbox, practice makes it easier, so I’ll end this with a writing prompt. Your mission, should you choose to accept it: write a single action scene that starts in a bar and ends on top of an elevated train. And for good measure, at some point you have to include a great white shark. Now go have fun. Thanks so much, Jonathan! And for all our friends and readers, go check out his books! « What Stage Are YOU In?